Wow, what a week! The MTC is absolutely fantastic. I'm loving every minute. Even though sometimes the days are long and hard, every day at the end I feel so satisfied with the day. Although I will say I never thought 8 hours of sleep could seem like so little. Anyways, my companion is Elder Fajardo. He's from Colorado Springs, but originally from Colombia. I'm actually the only gringo in my whole zone, so that's been a little intimidating (besides three sisters in our district, but as far as elders go, I'm the only one). Also, I was called as district leader, which also has been humbling, because I definitely don't speak the language as well as any other elders in my district, but I'm doing my very best to serve them and help them in everything the need. Also, my branch president and his wife are from the Canyon View stake, President and Sister Glazier, so just thought I'd mention it. 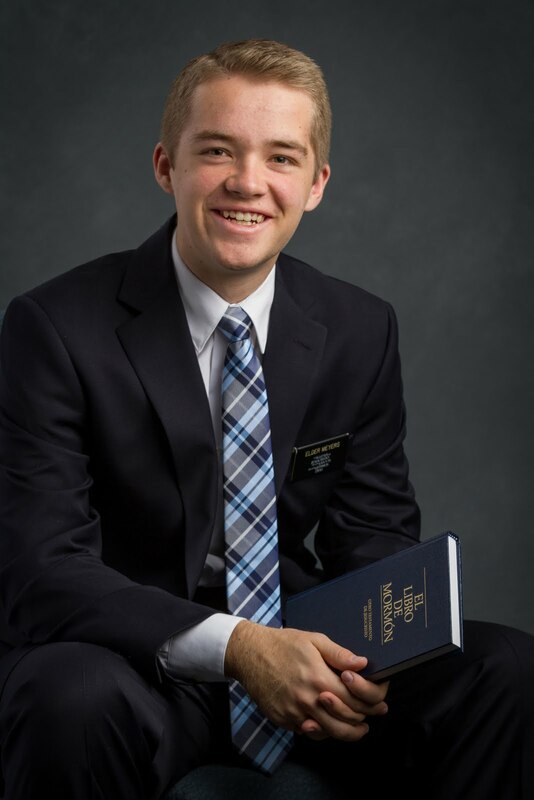 As far as other elders, I've seen Elder Bird a couple of times, Elder Pope quite a few times, especially the first day, and Elder Hess usually every day during lunch. Also, there is too much food, but it's all good, my companion and I just talk about how much our appetites have grown here and how it's a good thing that we're leaving soon. Also, thanks to grandpa for letting me know about the juice, all the elders in my zone keep talking about how all the juice keeps making them sick. Also, all the elders think the water bottles are super cool, so good job grandpa. A tiny bit about the others in my district: Elder Jaramillo is from Utah, but both of his parents are Colombian, and he's pretty quiet but humble and a good worker. Elder Garibay is from Springville and plays football. His family is from Mexico, and they are converts. Hermana Wyson is from SoCal and is going to Quito, Ecuador. She's a little quiet, but super funny and fun to be around. She played soccer and ran track. Hermana Cheever is from Sandy and is going to Buenos Aires West. She always knows what's going on, so if we don't know the schedule we ask her. Hermana Billin is from New Hampshire, and she knows Madi Earnshaw! So Madi props for having friends everywhere. She's going to Rosario. And the cool thing is all the elders in our district are going to Santa Fe, so we are all traveling together! Also, we got our travel plans and we leave next Monday at 8:30 in the morning! So fast! So we'll see whether or not I can email next week. Also, we got to go to the temple today, so it was really nice to walk around. Anyways, I can't think of anything else to say except one quick spiritual thought. Ok, quick spiritual thought: we watched a talk given by Elder Bednar in the CCM called the Character of Christ. It was literally the best talk I have ever heard, bar none. Anyways, the main premise of the talk is that in times when we would turn inward, Christ turned outward. In other words, when we are low or feeling sorry for ourselves, normally we want to say, I'm so sad, someone help me please, but in those times are the best times to turn outward and serve others. Here are some examples, you should all look them up and study them. Matthew 4:4-11, Christ in the garden with the guards ear, and Christ while on the cross with the thieves, soldiers, Pharisees, and His mother. It was super insightful. Se que esta es la obra de Dios! Quiero ser el mejor misionero que puedo, y se que puedo hacerlo a traves de mi Salvador Jesucristo. Tambien se sin duda que Jose Smith fue una profeta de Dios, y que restauro el evangelio a la tierra. El Espiritu Santo es real, y puede cambiar vidas, si traemos El. Estoy muy agradecido por la oportunidad de servir los hijos de Dios, y se que el Padre Celestial puede cambiar vidas a traves de mi si guardo los mandamientos. La iglesia es verdadera! P.S. Also please tell everyone to use DearElder if they want to write me here before I leave next Monday because I have time to read those and I will get them before emails here in the MTC. Plus letters are so so so nice to get so thanks! Please have people use it I can respond to those! Me and Elder Fajardo with our Branch president and his wife. Me and my companion at our residence.